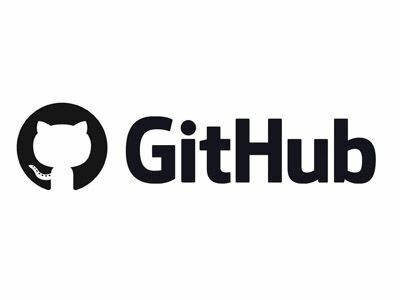 This is where I will share updates of current development. As well as a cataloge of current and past projects. Hi guys, just starting a new thread for development and discussion about the new project I've started. It's a personal project to full fill a specific role for my own career save but hopefully others will find it interesting too. 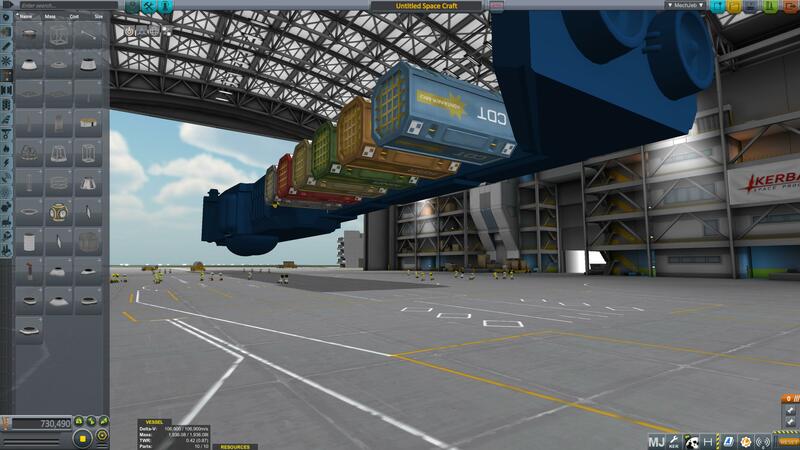 So in USI - MKS and associated mods there are these HUGE 5m shipping kontainers. I wanted a way of transporting at least 6 of these at a time. Due to their size and MASSIVE weight when full building a stock craft was getting ridiculously large and part heavy just to transport one of them. So i thought why not make myself a nice transport freighter that does one job and does it perfectly. So an idea was born. I've been watching @RoverDude's streams making his new parts and it gave me inspiration to download Blender and have a go myself (i've only ever done around an hour in blender a couple of years ago before this). So first of all a massive thankyou! 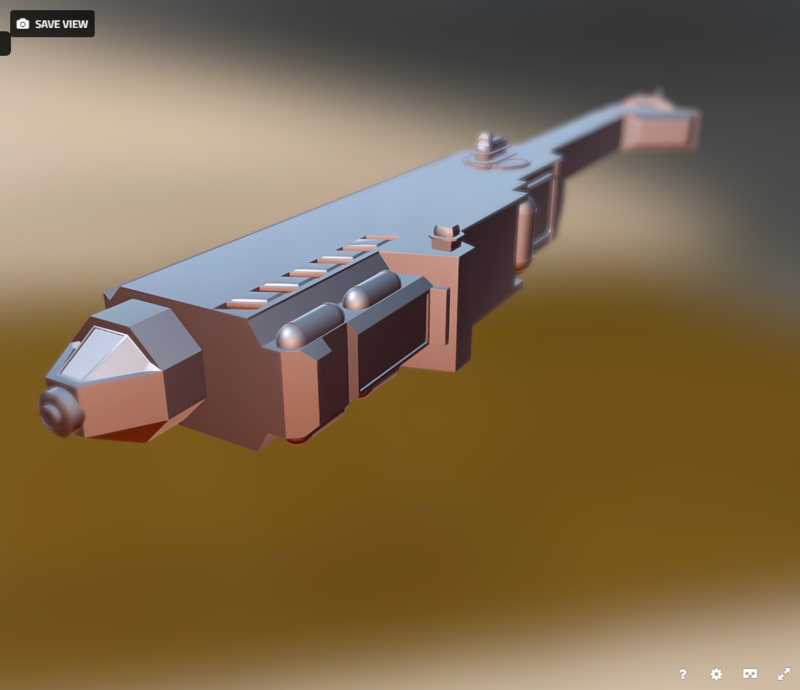 to RoverDude for streaming his workflow and answering some of my questions about blender as he was streaming. Here's the concept images i put together. Here's some of the latest shots after i managed to get the model through unity and into KSP. The attach nodes are all sorted for the Kontainers and my engines are working and KER is telling me i have 0 torque. Yay!! 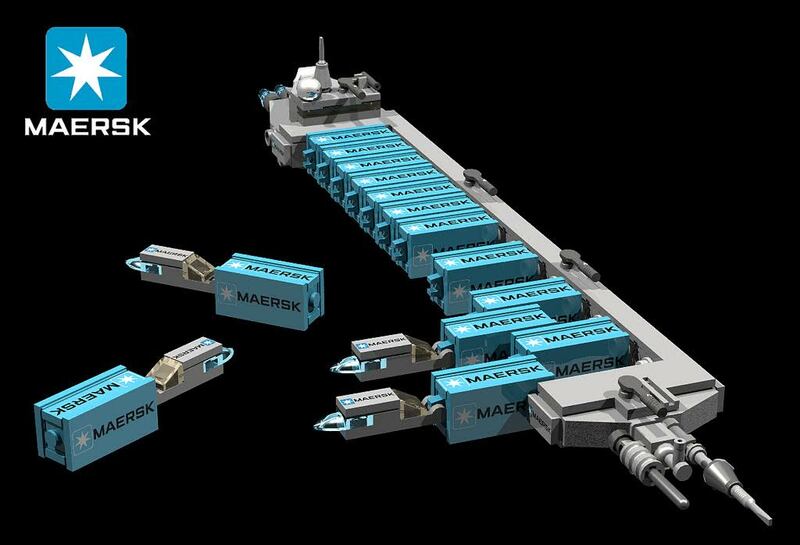 So the idea is to have a ship that can deliver 6 fully loaded 5m USI Kontainers. 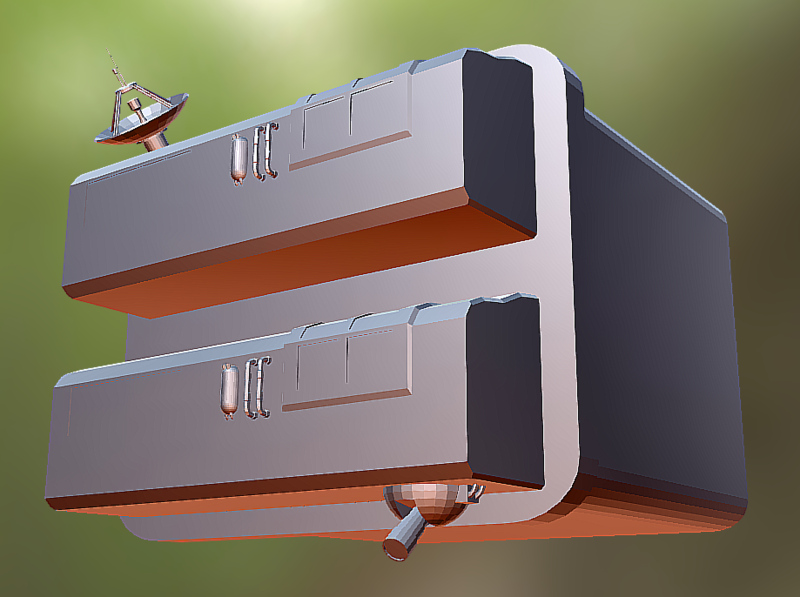 I'm going to make USI - Tools a dependency because i'll be using the load balancing feature on the Kontainers and freighter hull so that it automatically balances the weight and no one has to mess around with the engine tweakables. I'm also hoping to learn animations so i can put in a big cargo bay (compatible with Hanger from @allista) and a smaller airlock with an internal area where the access hatch will be and a few attach nodes for things like small KIS containers. In regards to balancing this with stock i simply don't plan to. I will include the amount of fuel that would make sense for the volume of the part but from there i'm simply going to give the engines what ever thrust and ISP they need to get 10,000dV when fully fuelled and loaded. It's designed as an end game craft to support LARGE kolonies. @dboi88 This looks like a destiny gun. Hehe unfortunately not many elements from this pic ended up in the model, I think they're all too far away from Kerbal like on this ship. 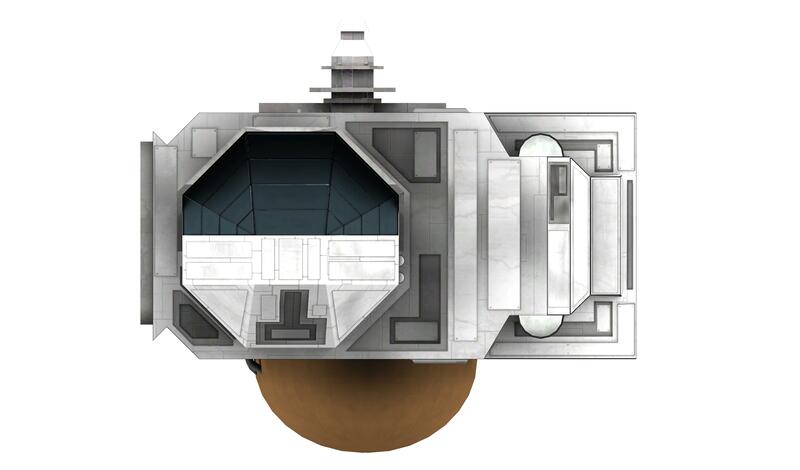 If Rover made the 3.75m kontainers fit properly inside the FTT cargo bays (so they don't clip through the sides and stick out just enough to explode on re-entry), then a Honeybadger-based craft could be a decent surface-to-starship cargo shuttle for this 300t behemoth that looks to be able to square off very well against the StarLifter-class ships from FTT. One of my pet peeves (and I imagine shared by many other people) with large ships is how many flywheels you need to stick on them in order for them to turn 180o in under a week, and the exterior of that ship doesn't look like it has many attachment nodes, so make sure to give it a hefty internal reaction wheel or at least some decent engine gimbal. From the test images, it looks like it has one or the other-how quick can it do an about-turn while weighing >6kt fully loaded? 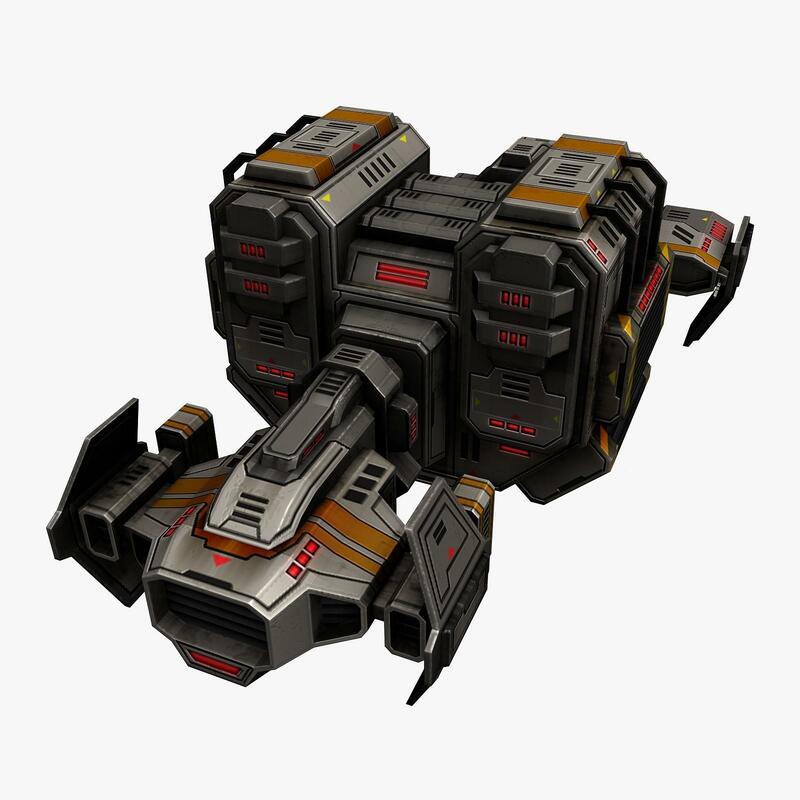 One of my pet peeves (and I imagine shared by many other people) with large ships is how many flywheels you need to stick on them in order for them to turn 180o in under a week, and the exterior of that ship doesn't look like it has many attachment nodes, so make sure to give it a hefty internal reaction wheel or at least some decent engine gimbal. From the test images, it looks like it has one or the other-how quick can it do an about-turn? Yeah i agree. You will need almost no extra parts with this mod. My first reaction wheel setting was soo high if i span it at full speed the kontainers would spontaneously explode! The final settings will allow reasonable maneuverability with both reaction wheels and RCS thrusters for maneuvers and docking when fully loaded. I was thinking somewhere between 5-10 seconds for an about-turn fully loaded. Any exterior nodes will be there for a specific reason. I plan on having a little airlock/prep area inside a little cargo bay. 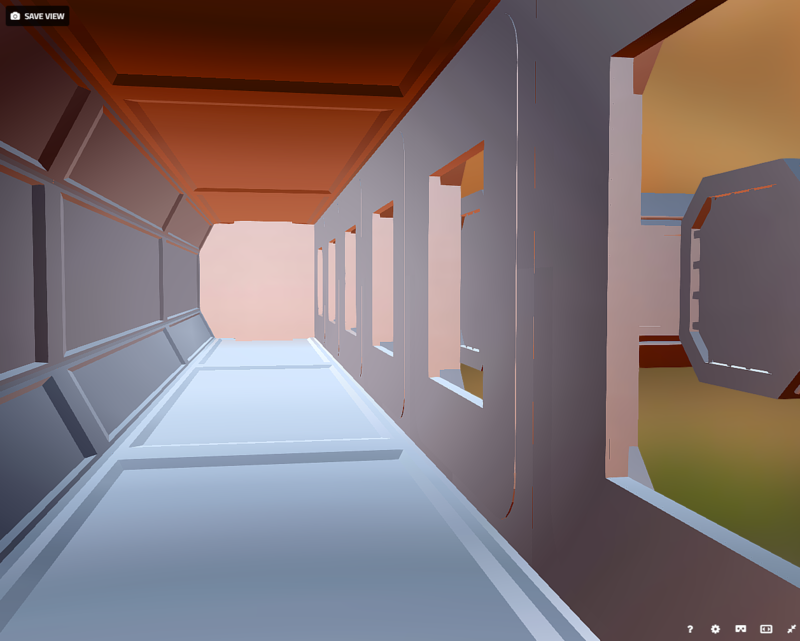 So you'd come out of the hatch into the cargo bay, sort out your KIS gear (will have nodes for small KIS containers) in the prep area then open the airlock doors to exit the ship. Oh, I think it will be a case of other ships docking with it, not the other way around, so there should probably be nodes for attaching docking ports as well, unless they can also be integrated (or placed on the ends of the kontainers, which have a node by default). The heaviest it could possibly be (excluding fuel) is 6,274.4t with 6 kontainers of metals, which would give it an acceleration (from the 3MN of thrust quoted in the dev pic) of ~0.045g, which seems somewhat at odds with its ability to pinwheel on a (very large) dime. Still, this is a very early dev concept, with plenty of time to tweak these sorts of things. 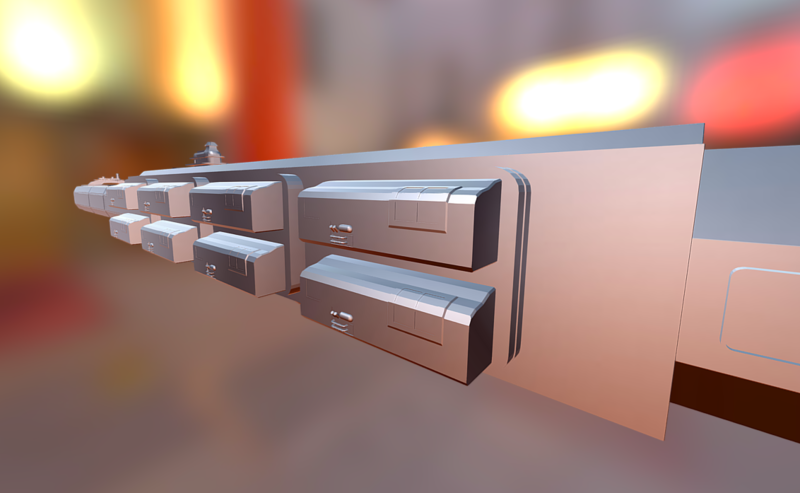 As an additional observation, maybe the container bays would be better off being a standard attachment face, and in order to attach kontainers there would be a series of (very short and light) adaptors to turn that standard slot into an attachment point for each size of kontainer and tank for more flexibility. If you're willing to make B9 Part Switch a dependency then this could be done with only two parts (a Tank Adaptor and a Kontainer Adaptor) that could be configured between the four sizes of each. Looking forward to seeing the IVA for this thing-I'm betting on buttons galore or some scifi nod-if you make an IVA, that is. From what I've picked up, IVAs are difficult and time-consuming to make so if you choose not to make one that's fine by me. Yeah i suppose. I was also thinking about it carrying a shuttle in the cargo bay. Maybe even a tug for the kontainers. But then i'd have to deal with docking and the weight transfer wouldn't work if. So probably a tug with a smaller Kontainer to take deliveries around. 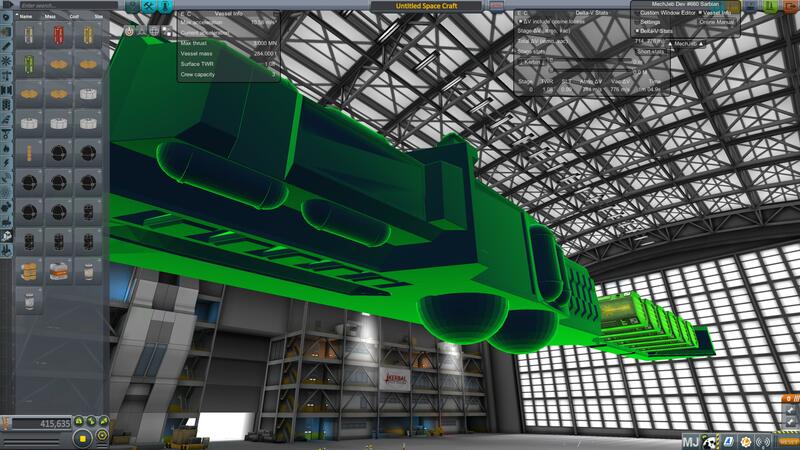 The kontainers need to be attached directly to the hull for the weight transfer mechanic to work. If it get's an IVA it'll be a straight drop in from somewhere else that is nothing kerbal like but might be quite amusing. Though i'm thinking of using the long truss on the back as part of the internal EVA space as a long corridor. Send your engineer down the tunnel to repaint the kontainers?? With the attachment points, will they only ever carry 5m solid-object kontainers? 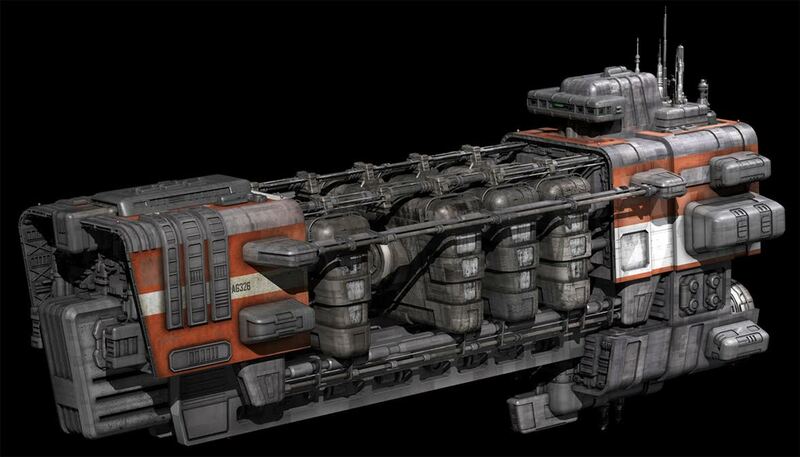 As for docking, I'd probably end up using the ship as a tramp freighter, with each planetary base (except Eve, Tylo and Laythe) having its own shuttle to fly up to the freighter with fuel and resources for export, refuel the freighter, load/unload the imports/exports and bring them the imports back down to the planet, at which point the freighter flies off again to the next point on its triangular trade. 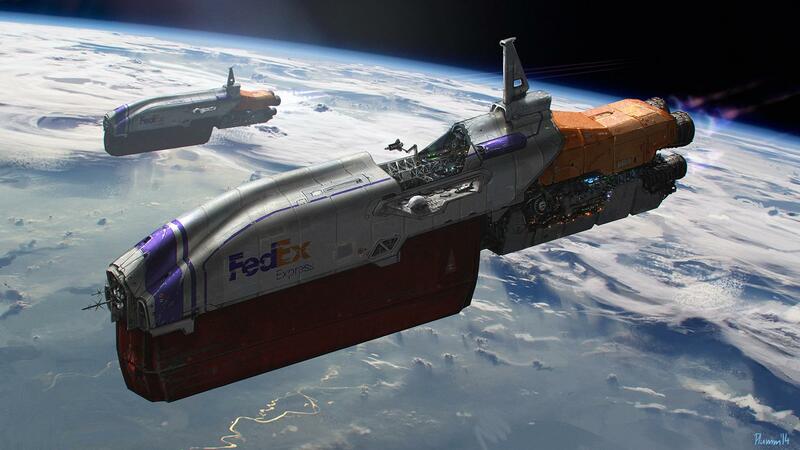 These resource transfers would probably be quite large, likely requiring a cargo vessel much larger than could be practically piggybacked onto the freighter (this would be much easier if we had Orbital Logistics to cut out the docking altogether). The IEVA sounds like a novel, but interesting idea. The ship interior likely has large enough dimensions to avoid clipping issues-so in order to exit the ship a kerbal could either exit straight to space or exit the cockpit into this internal area (with the KIS boxes mentioned) and then go through another airlock to get outside? With the attachment points, will they only ever carry 5m solid-object kontainers? No they are just attachment nodes so you can put anything there. As for docking, I'd probably end up using the ship as a tramp freighter, with each planetary base (except Eve, Tylo and Laythe) having its own shuttle to fly up to the freighter with fuel and resources for export, refuel the freighter, load/unload the imports/exports and bring them the imports back down to the planet, at which point the freighter flies off again to the next point on its triangular trade. These resource transfers would probably be quite large, likely requiring a cargo vessel much larger than could be practically piggybacked onto the freighter (this would be much easier if we had Orbital Logistics to cut out the docking altogether). 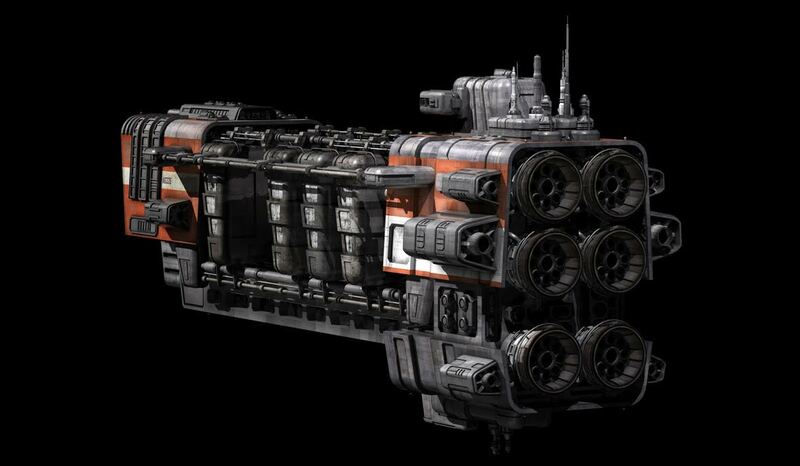 Yeah i was thinking a small crew transfer shuttle with maybe one 1.25m container for some supplies. I'll have to see what reasonable fits inside the hanger. Yeah that's the idea. It'll only really be a cargo bay like any other with a crew hatch in it. Just like when you eva out the back of a cockpit into a cargo bay.. But it'll be set up as a room with doors that open to outside. Based on the fact it's only going to be a 20 part ship at most i'm thinking i can really go wild with colliders and polys. Looks interesting. I look forward to seeing where this goes. 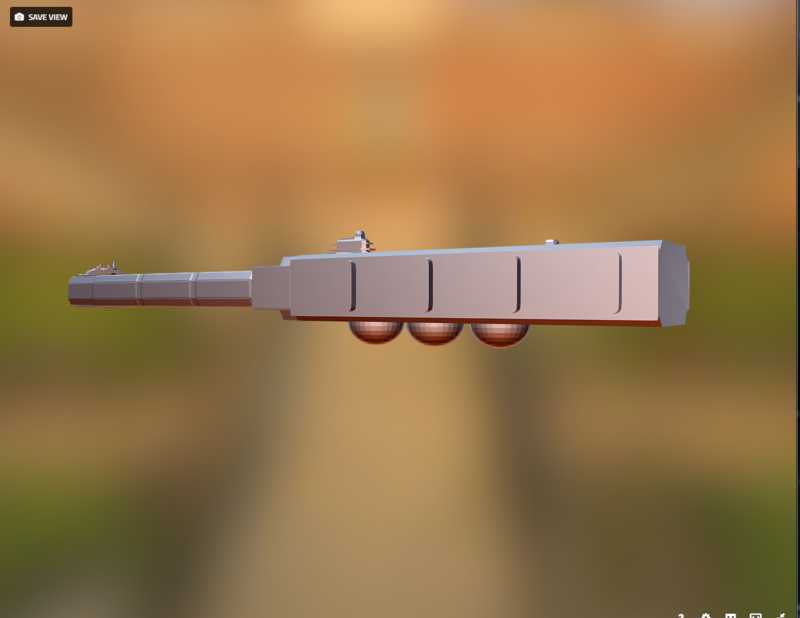 It might be fun to have a variant (or a way to combine the parts) that can carry the huge spherical tanks as well. Might be able to do it with a set of adapters instead of that long arm - mount the tank(s) inline. Yeah i don't see why with a bit of planning that can't work. I'm going to write an update mostly just so i can get straight on where i'm up to. Ok I spent last night doing a lot of tidy up work on the model. 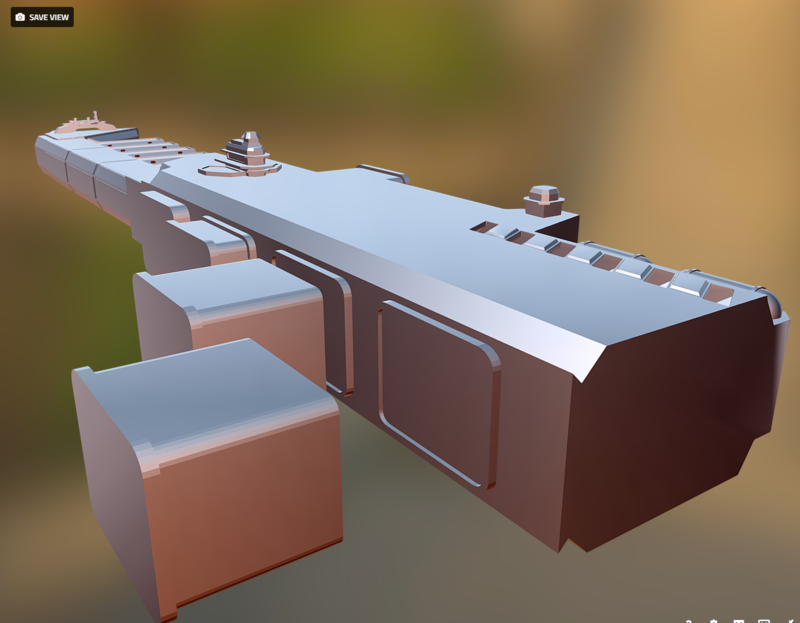 I'm new to this and was learning long the way so there's lots of bits I've gone back and re done, as well as removed loads of random vertices and edges that were floating around. I also got rid of the cockpit, I used a model/tutorial to make it and it just wasn't in any similar style at all. I can probably make something that looks better now something square. There was a little voice in my head that was shouting "this isn't like lego! we like lego!" for the past 3 days. Having the hull one huge piece gives me loads of advantages in regards to the weight transfer mechanic and simplicity. But then we all play kerbal because we like building things don't we? So I came up with an idea last night. I was also very conscious of how big the PAW might get for the freighter and this fixes that issue too. Down the back side of the freighter that currently just has those ugly ridges i'm going to add 4 big attachment points for interchangeable panels. So the idea is that you'll be able to pick from a selection of panels which each have a different function to customise the freighter. The models for this will literally just be an outer panel with some detail on one side but the theory is that each panel is actually just the exterior and the 'useable' space for each module is actually the space inside the freighter. So if we had a hab module the panel would have some windows and vents and look like the area behind it is the Habitation space. 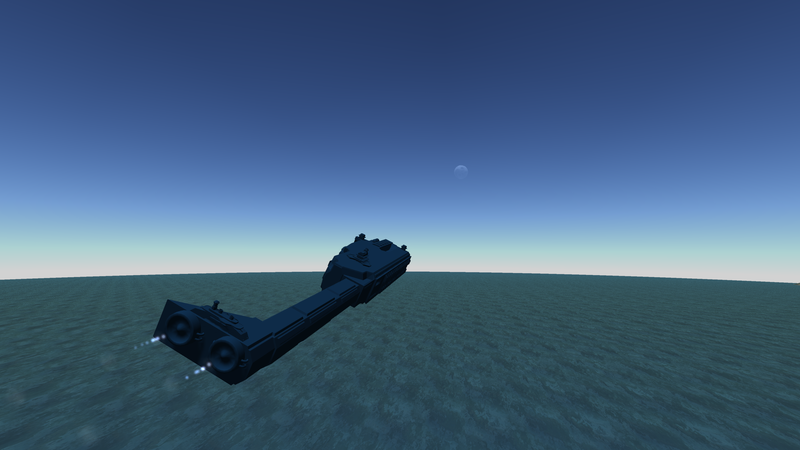 Again i can make these use the weight transfer mechanic so there'll be no issues with balancing the engines. I'm also toying with the idea of doing a smaller freighter without the rear truss that can be used as transport ships using the above parts when you don't want to transfer a boatload of resources. 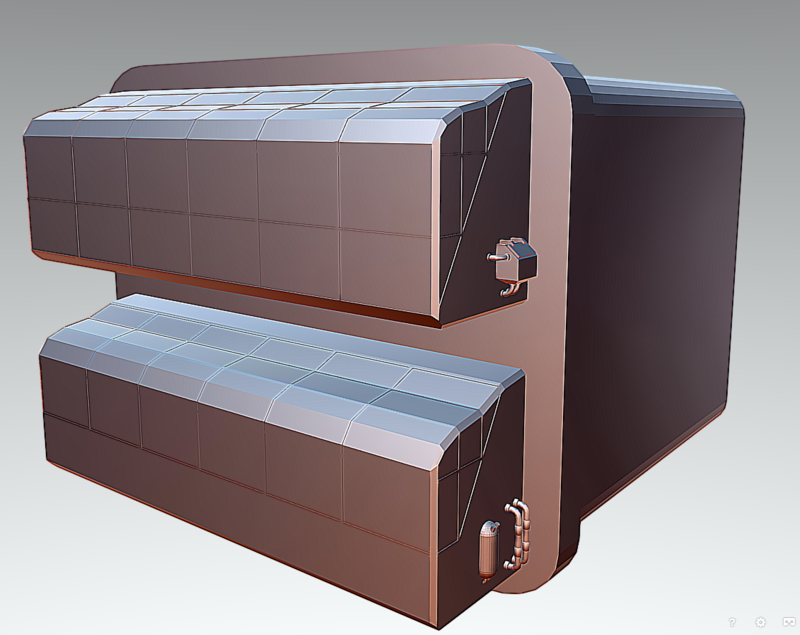 I think i'll also make a 3rd freighter hull with a stretched rear truss that will comfortable fit 6 of the big round fuel tanks instead of the Kontainers for @DStaal no sure which size yet though, will have to see what one looks like against the model in blender. Actually, it would be really nice if these panels acted as though they were performing the functions of the modules they represent, in order to greatly ease using this ship with MKS/LS-or will the freighter have a bay system like MKS? If yes to the latter, maybe the panels could form part of the single part ship texture and change automatically according to the bay config. That being said, does the bay mechanic allow for having multiple configurable containers in one part (so the kontainers could potentially be integrated into the vessel itself)? Yeah that's what i was thinking. I need some more parts on there otherwise the PAW will be too big on the freighter. So you'd pick the freighter. then pick from 8 or so panels to attach to the side. The panels will be what has the functions attached, so right click on a hab panal and you'd get the same hab settings as on an MKS hab module. The kontainers will just be normal MKS kontainers with an MM patch attached with 6 normal attach nodes on the big truss. So you could put what ever you wanted on there. EDIT: I was thinking you were aiming for 3.75m kontainers, which are a little narrower than Tundra mods due to being squared off rather than circular. But your OP says 5m, doesn't it? 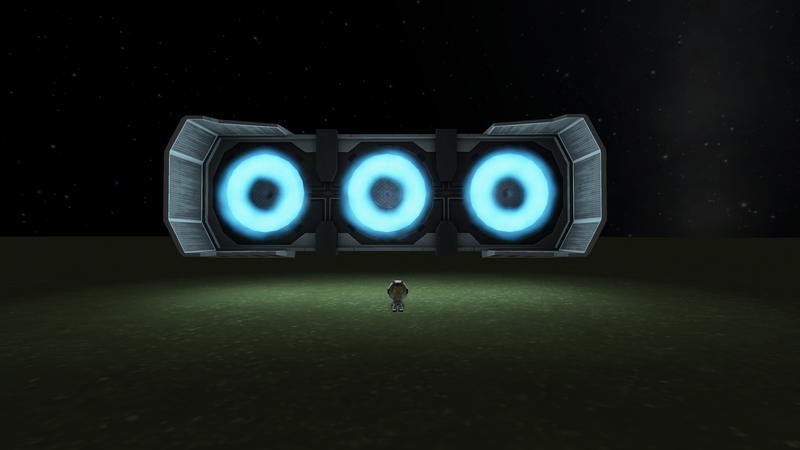 Which means it'd handle the modules just fine, size-wise, and it just needs to be able to weight-balance them. Hmm, not sure on that one due to conflicts with MKS itself and people running into issues with the weight balancing of the MKS parts. But it'd be a simple MM patch to add to all tundra modules, just a couple of lines. Fair enough! I'll wait and try it out myself. I've almost finished re-building the model from scratch and planned out spaces for 5 interchangeable module slots, the large cargo bay and the small EVA airlock. I've learned loads so this new model has 8000 less faces and has a lot less geo mistakes so should be a lot easier to unwrap. Here's how i see the interchangeable modules looking. 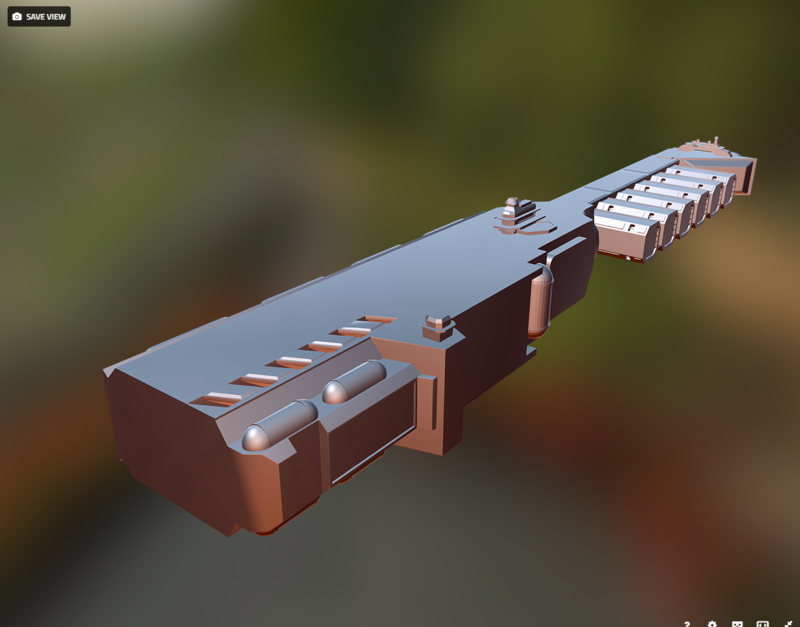 I liked the look of the Honey badger so I've gone with that form factor. And the Kontainer Dock Mounts with windows to the internal EVA space so they can be accessed from inside the EVA space. I've done the first of the Interchangeable Modules, The Crew Quarters. The Second Done, Hab Common, A large Viewing Cupola up top and a Canteen on the bottom. Model with both the Hab Common & Hab Quarters, a real Cruise Liner! 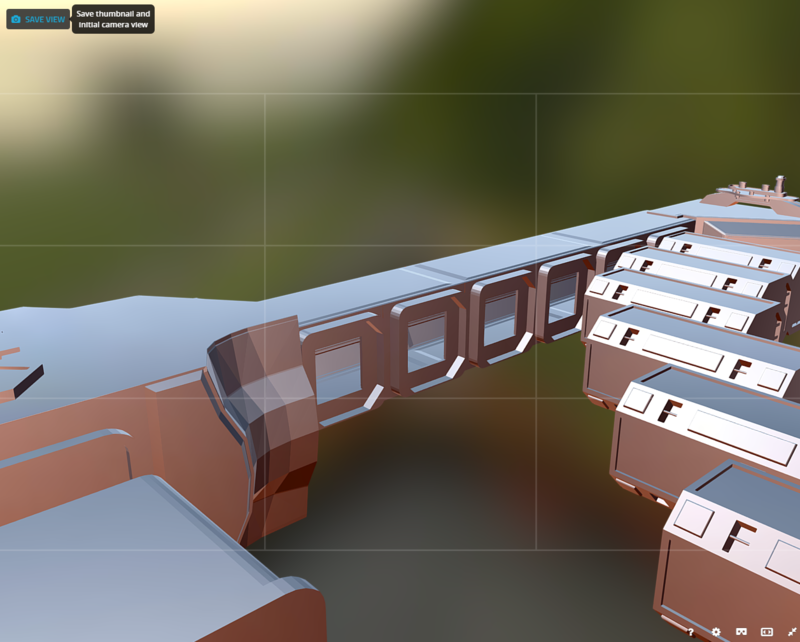 We are now going to have a set of 'detail' parts to be shared across all the interchangeable modules and freighter, so i don't have to keep creating the same tanks/pipes hatches ect, and will also be able to use shared texture space. Yay for optimisation. 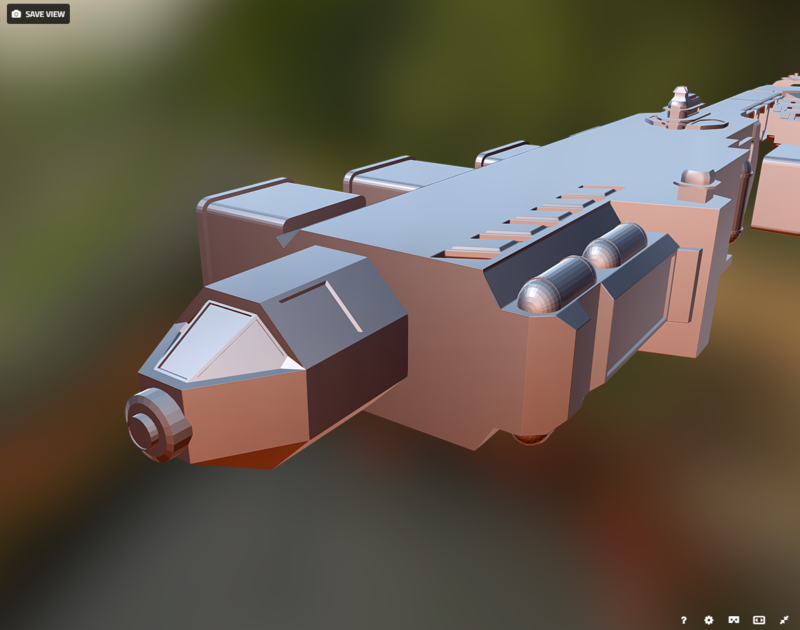 I'm also UV unwrapping and then going to texture these details parts now because i'm learning loads of techniques that i can use when finishing off the freighter model. 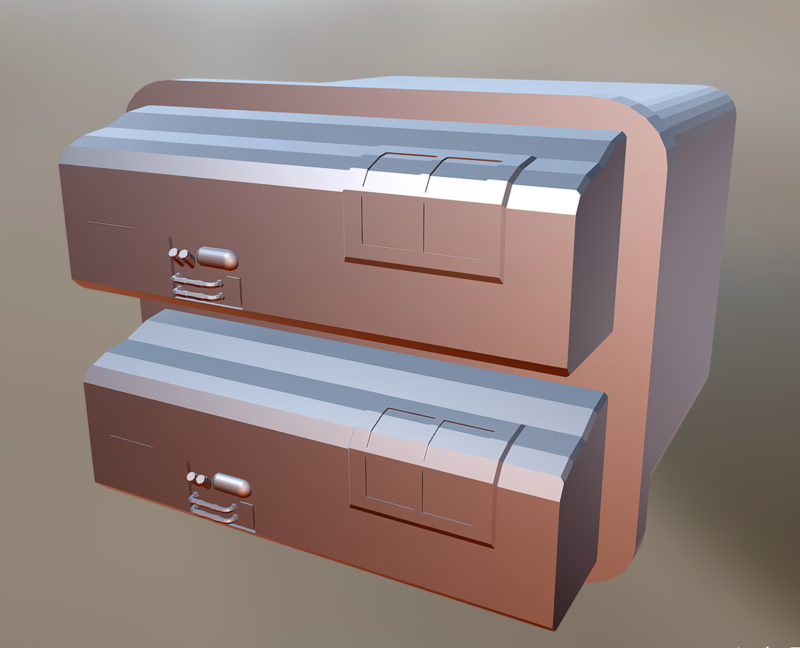 So at the minute i'm concentrating on improving the details parts I've already made and modelling new ones. Here's the Science Lab Module!